This cushion sits quietly on the bed; it has no practical use at all, but I think it’s so pretty. 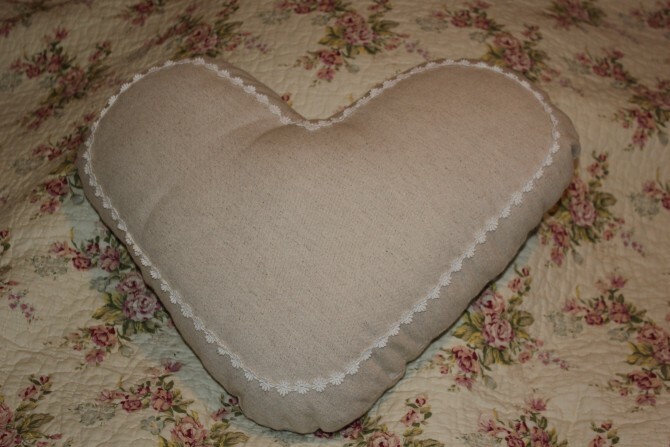 I cut the cushion pad open, emptied the filling into an empty pillow case and made myself a paper heart template. After making the heart shaped cover I had to manipulate the filling a little to achieve a good even shape before hand-stitch the opening. I used white daisy trimming, however I think any dainty trimming would look good against the ‘rough’ texture of the natural beige.